Garrett Hinchey graduated from the School of Journalism in 2014 and received the Joan Donaldson Scholarship in his final year, starting his fellowship at the CBC upon graduating. During his four-month internship at the CBC he worked in the Vancouver newsroom, produced for national radio syndication and also worked for the investigative unit at The Fifth Estate. In 2016, Hinchey’s #NWTVotes series of online forums was selected as a finalist for the Canadian Journalism Foundation’s innovation award. CBC North’s digital team, of which Hinchey is a part of, won the 2015 RTDNA national award for best overall digital: small/medium market. He has also been nominated for a Canadian Online Publishing Award for his work while at UBC. In the summer of 2015, Garrett was selected as Canada’s delegate for the Young Reporter program at the Pan Am Games – a program aimed at giving young journalists experience and exposure in covering an international multisport competition. One journalist under the age of 25 was selected for the program from each participating country. 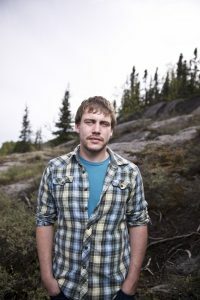 He is now based in Yellowknife where he works for the CBC as their Social Media Editor for the North region, covering the Yukon, Northwest Territories, Nunavut, Nunavik and Cree Unit. Without UBC’s journalism school, there’s simply no way I’d be where I am today. I entered the j-school in 2012 with zero journalistic experience, straight out of my undergraduate degree (in political science) at UVic. I remember vividly coming into the school on my first day and having an overwhelming feeling that I was in way over my head. The turning point came very quickly, though. My professors and colleagues were all so welcoming and reassuring, and I was quickly available to develop the confidence I needed to make it in the program. Many of those people remain very close friends today and have influenced my life and career in all sorts of ways. The skills came along shortly after. From a practical standpoint, the journalism school gave me career opportunities that I never would have had otherwise. The school helped me build my multimedia portfolio by helping us do things like get videos produced during our integrated journalism unit published by media in the city. The school helped me land an internship at the Globe and Mail, as well as at UpHere Magazine and CBC North in Yellowknife. The first two of those helped me create a portfolio that’s helped me launch my career. The latter helped me create connections that allowed me to do the work I do today. I didn’t know it at the time, but that advice would help me follow in his footsteps as a Joan Donaldson Scholar, have a piece of mine grace the front page of the Globe and Mail, and get a job at CBC in Yellowknife, just two years later. What’s been the piece of journalism you’ve produced of which you’re most proud of? The Northwest Territories is a massive mass of land, with a very small population. It’s dotted with over 30 communities, some of them very remote and not accessible by road. That can make connecting people – particularly important during elections – a difficult process. My solution to this during the 2015 territorial election was to conduct online election forums for candidates in each of these remote communities using a chat platform, for the very first time. It was incredibly difficult. Not only did we have to contact each of the candidates individually, as there are no parties in Northwest Territories politics, and convince them to participate – remember, many of these people live in communities with spotty internet connections and are not particularly tech-savvy – I also had to schedule 18 forums within a 3-week timeframe, read up on each riding and its individual issues so I could moderate effectively, and deal with any technical issues that popped up while I was moderating. I remember getting a call 10 minutes prior to one forum from a candidate in the community of Ulukhaktok, which is on the Arctic Ocean. He was an elder and was having difficulty logging into the platform. I explained everything to him step by step, and then asked him if he was online. “Not yet,” he said. “I’m on dial-up, so I’ll try when I hang up the phone!” It was one of those moments that made you understand the enormity of what we were trying to accomplish, but also why it was so important to bring these candidates to their constituents. In the end, we pulled it off. CBC North hosted online forums in 17 of 19 ridings (one was acclaimed, and we were unable to schedule one), often receiving many questions for the candidates from voters in remote communities through email, social media, and the chat platform. It’s the most ridings a single media outlet has ever been able to conduct forums in a single territorial election and it was extremely well-received by the people of the territory. The project was recognized as a finalist for the Canadian Journalism Foundation’s Innovation Award. It was nice to get that recognition. But that project was so much more rewarding because we were able to use technology to connect people in a way they’d never been connected before. To me, that’s my mission as a journalist working in the North, and in particular as a digital journalist. Has the j-school alumni network been helpful for you in terms of finding stories, sources, support and jobs? It’s strange to say after having spent two years working so far away from Vancouver, but I feel like I’m still part of the school of journalism. I still go to my former professors for career advice and guidance. A former j-school colleague, Blake Murphy, gave me the opportunity to join ESPN’s TrueHoop Network and write about the Toronto Raptors for 3 years (also a dream of mine) when I was just getting my career off the ground. One of my classmates, Jimmy Thomson, works for CBC North and we still work together regularly. And many of my best friends and confidants are people that I met at the journalism school. Right now, I’m working with J-school faculty and alumni on a Global Reporting Centre project, Alcoholics Unanonymous, which aims to shine a light on social isolation and alcoholism in remote communities in Canada’s North. Growing up in Yellowknife, it’s a subject that’s very personal to me, and I’m really excited to get down to work with the GRC team on a piece of solutions journalism that could have an impact on my home territory. Do you have any words of advice to students or prospective students at UBC School of Journalism? This program will give you everything you want. So want everything. I’ll echo the piece of advice that started me on my way: say yes. You’re more ready than you think you are. If you can do that, the sky is the limit. I’ll add another thing: always find a way to be proud of your work. There’s nothing more powerful in an industry than a journalist who truly believes in what they’re doing. Trust your instincts and you’ll find those amazing stories and opportunities that will get you where you want to be.